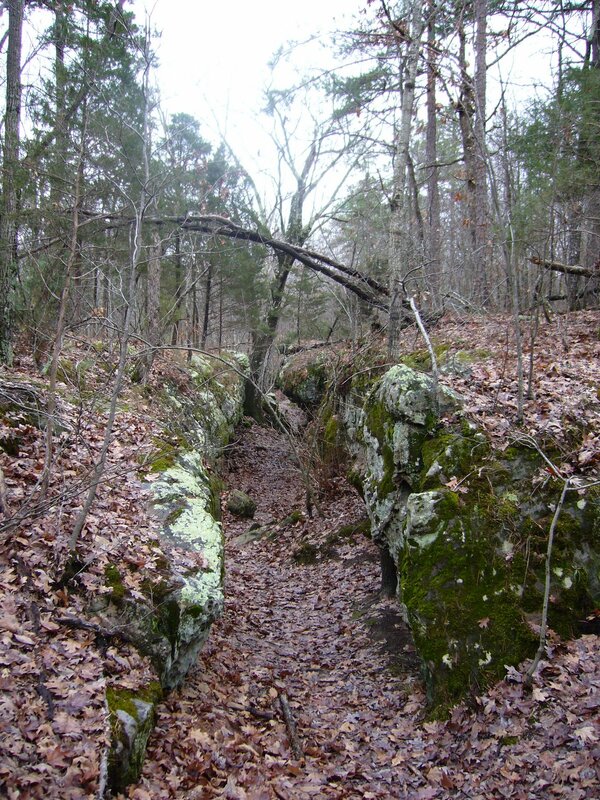 Pickle Springs Natural Area lies in Ste. Genevieve County, about an hour south of St. Louis. 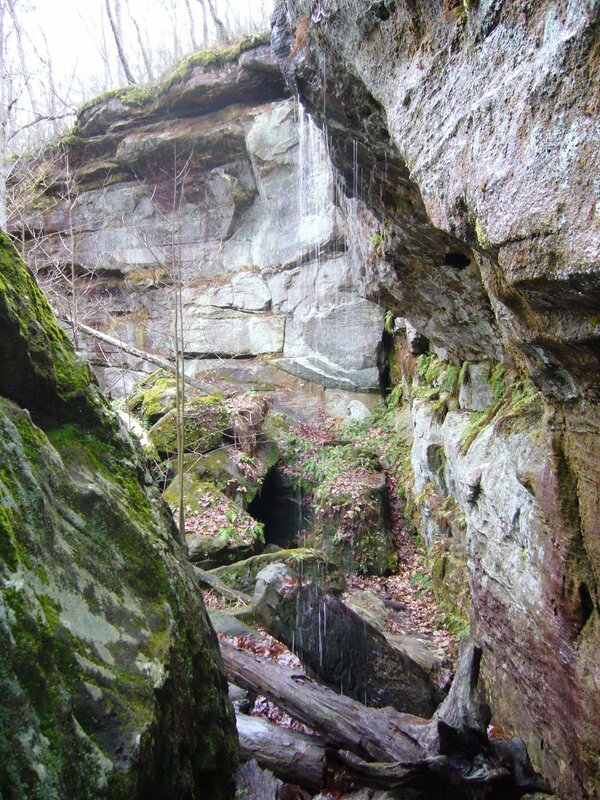 Like Hawn State Park, the geology of this area and its effect on the flora have resulted in a unique collection of geologic features and plants found in few other places. The Lamotte sandstone outcrops that dot the landscape were formed nearly half a billion years ago when sand deposited in an extensive maze of braided river channels was cemented and buried under younger layers of limestone and dolomite formed from deposits on the floors of ancient seas that covered the interior of the continent. Later, the periods of uplift that created the St. Francois Mountains and resulting erosion of overlying strata once again exposed the sandstones at the surface. Millions of years of water, ice, rain, wind, and plants have further shaped the exposed sandstones, creating fanstastic shapes and formations and cool, deep canyons. The weathered sandstone created acid soils which support many unique plants. 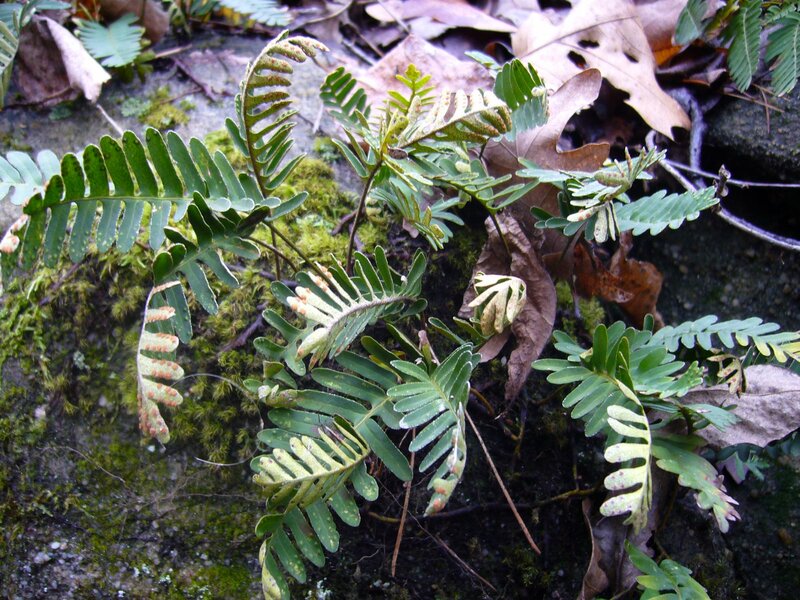 During the ice ages, northern plants and animals moved into the area ahead of the advancing glaciers. Mammoths roamed the landscape grazing on the northern vegetation supported by the area’s acid soils. Eventually the ice retreated, and so did the mammoths. But many of the plants remained – able to hang on in the cool, moist canyons long after the mammoths that once roamed these canyons disappeared. 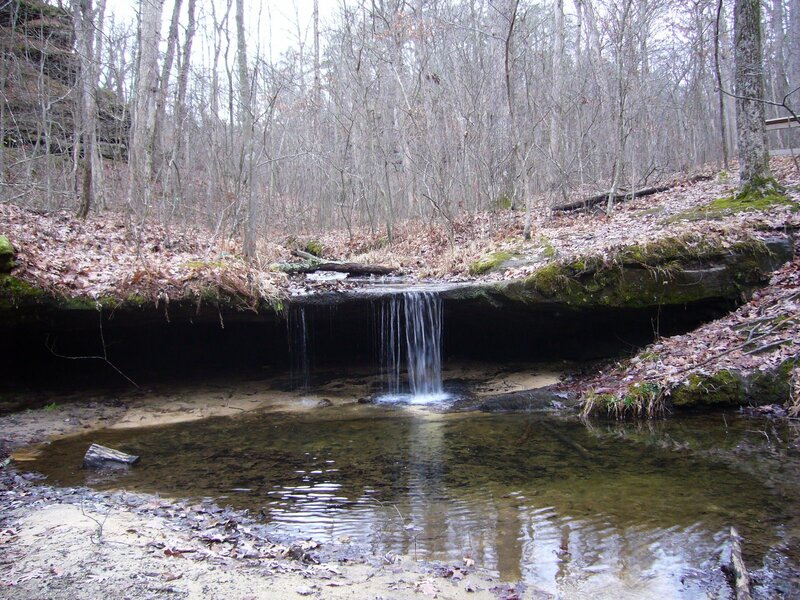 Because of this unique concentration of rare plants and geologic features, the area has been designated a Missouri Natural Area and a National Natural Landmark. 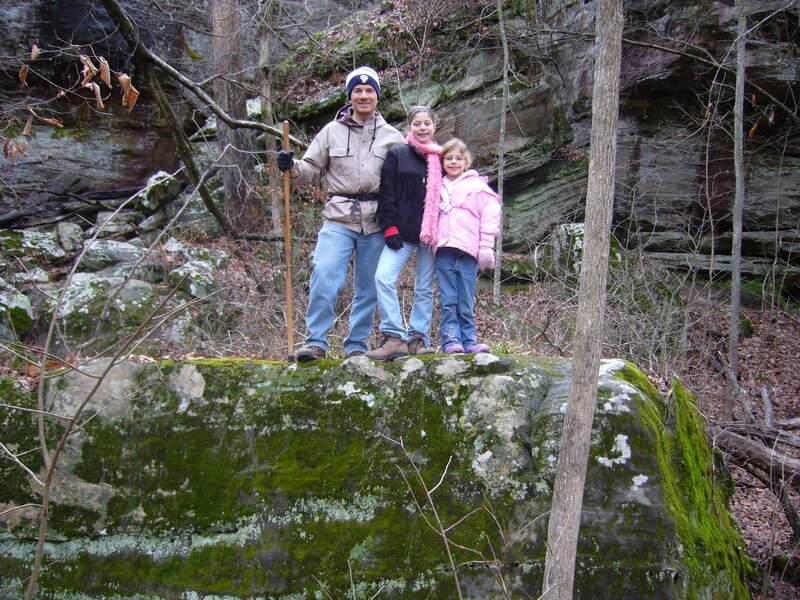 Yesterday I hiked the aptly-named ‘Trail Through Time’ with my family. 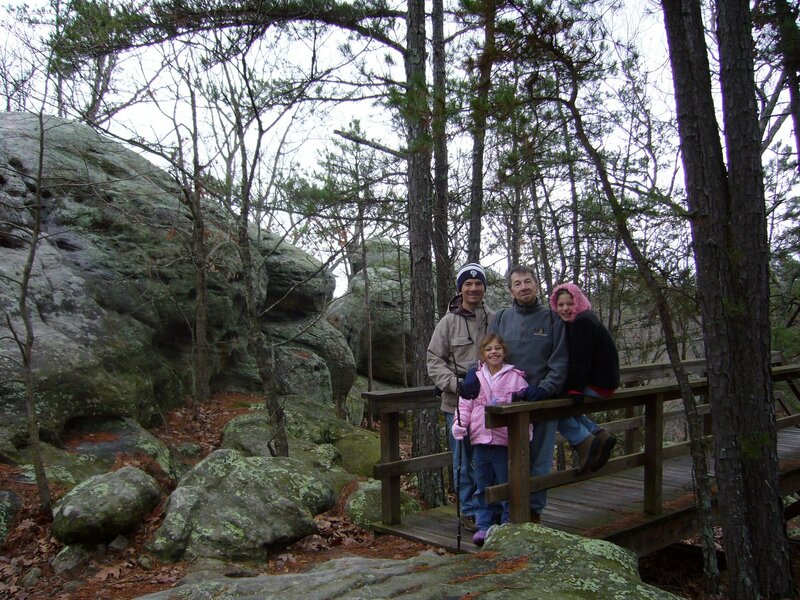 This 2-mile trail is one of the most “feature-packed” trails in the state, with something to look at around almost every bend. Almost immediately the trail leads to the Slot, the result of a vertical fracture in the Lamotte sandstone that was loosened by leaching and then widened by erosion. The unique partridge berry (Mitchella repens) was seen on the moist, vertical walls of the rock, growing among strange holes, pockets, and ridges that formed as a result of the sand grains being variably cemented. A short distance from The Slot lie Cauliflower Rocks – large moundlike formations (also called hoodoos or rock pillars) formed from jointed or fractured sandstone that undergoes deep solutional weathering followed by erosion and weather-mediated shaping. Hoodoos occur primarily in this type of rock due to its granular, variably cemented and cross-bedded matrix. On the south side of Cauliflower Rocks lies a special type of buttress arch called Double Arch. It occurs at almost a right angle to the adjacent rock outrcrops, suggesting formation along a set of fractures running perpendicular to the main fracture trend of the area, but the precise details of its formation remain a mystery. After leaving Cauliflower Rocks the trail descends steeply into a deep valley, at the bottom of which lies Pickle Creek just below its origin in a box canyon south of the Natural Area. Lush vegetation in this cool, moist valley contrasts with the stark rocks seen earlier. 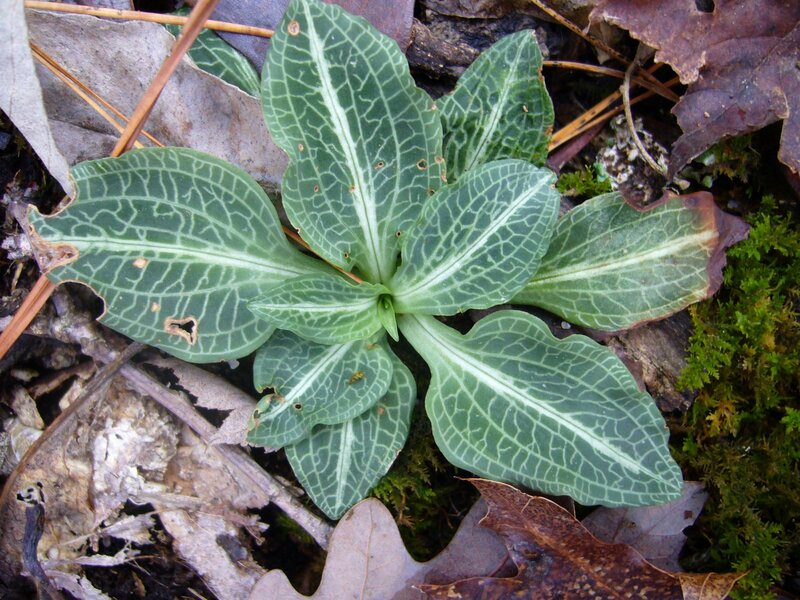 …while this rattlesnake plantain orchid (Goodyera pubescens) was seen in a colony growing at the base of a black oak tree (Quercus velutina) just above the creek. 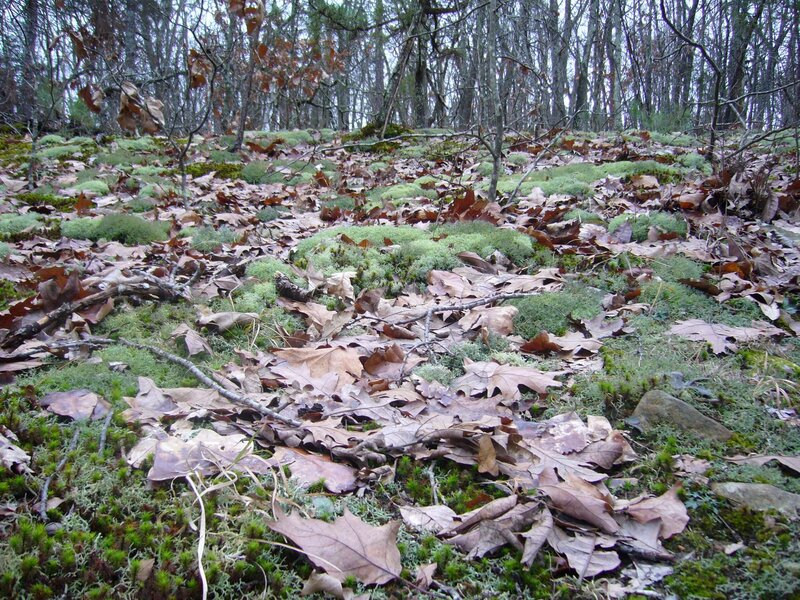 Mosses and lichens were also abundant in the valley. 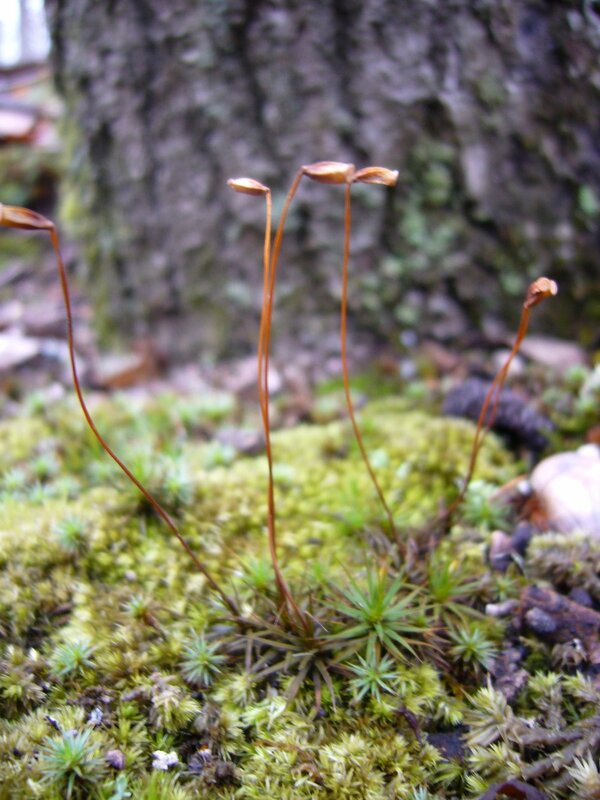 This little hair cap moss (Polytrichum sp.) with its distinctive fruiting structures was growing in a colony at the base of another black oak tree. The members of this genus prefer acidic environments. 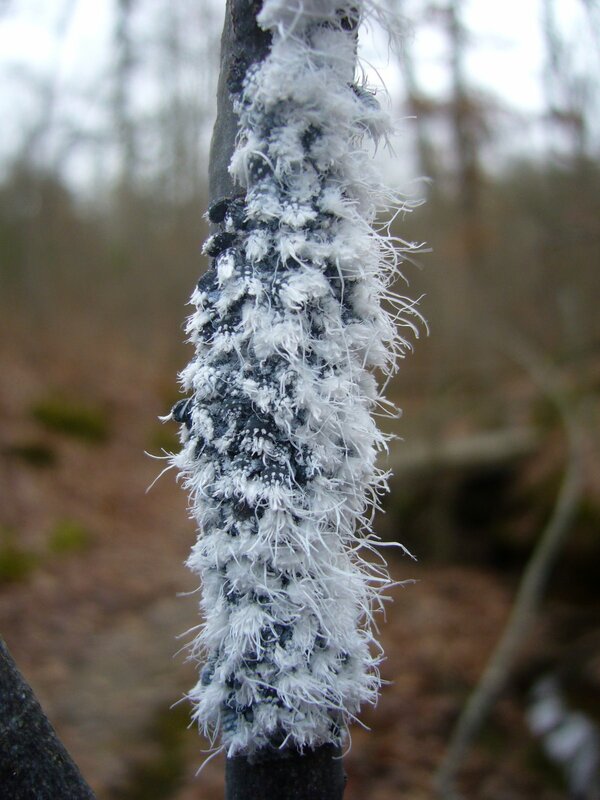 Further ahead, along Bone Creek, several colonies of wooly aphids (family Aphididae) were seen on the branches of a small hop hornbeam tree (Ostrya virginiana). …and good exploring for the nimble. By now, the trail has passed the halfway point and is looping back to the west, where it ascends to Dome Rock Overlook. Along the way, a fascinating variety of lichens, including reindeer lichen, covers the forest floor where they are supported by the acid soils. Dome Rock Overlook is a the largest hoodoo complex in the Natural Area. The thin soils and exposed conditions create a harsh, dry, windswept environment that only the hardiest of plants can withstand. Only a few small blackjack oaks (Quercus marilandica), shortleaf pines (Pinus echinata), and farkleberry (Vaccinium arboreum) survive here. Despite their small size, some of the trees growing here are at least 150 years old. The trail descends from Dome Rock Overlook and passes underneath, providing spectacular views of the sheer rock face below the overlook. 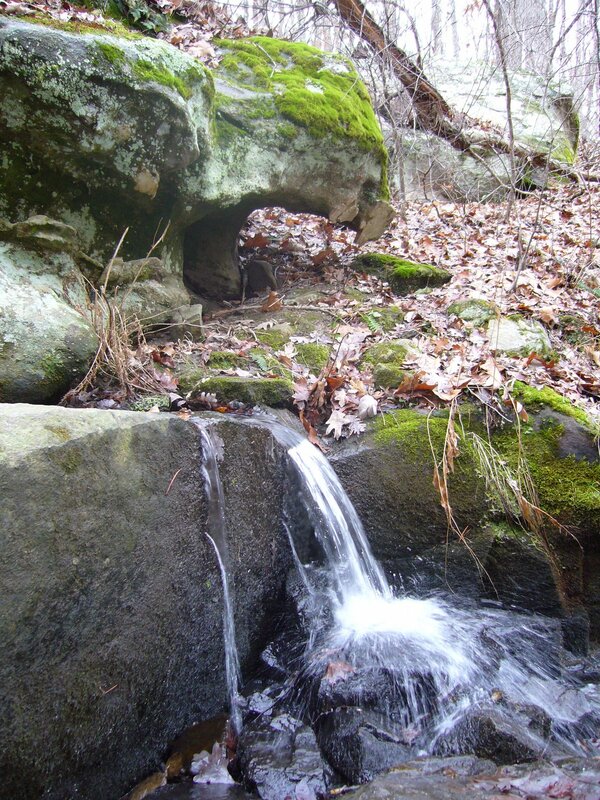 The trail completes its descent back into Pickle Creek Valley, where Pickle Spring can be seen. This small, permanent spring – an unusual feature in sandstone where seeps are more common – was an important source of water for early settlers. 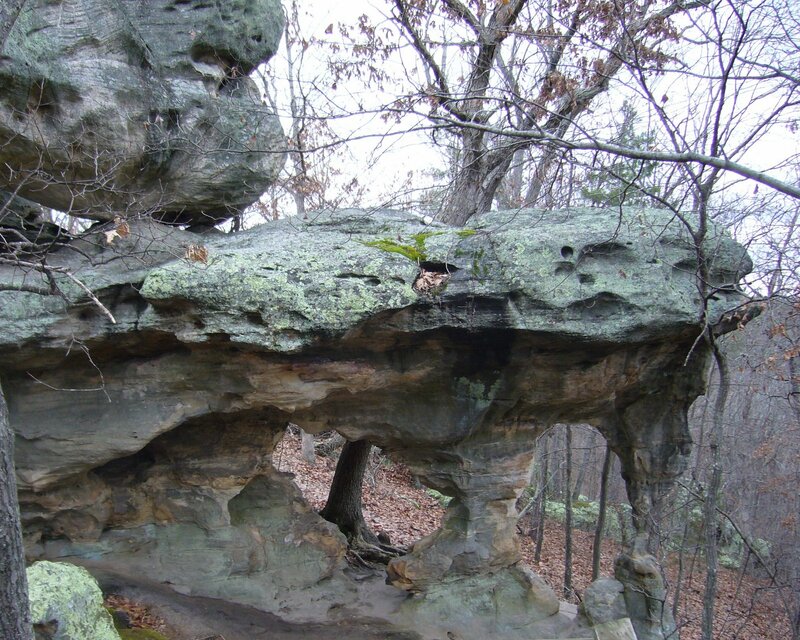 Further along the trail lies one of the areas most unusual features – Rockpile Canyon – formed some 50 years ago (a fraction of a second in geologic time) when part of a sandstone bluff collapsed in a rumble, leaving behind a sheer bluff face and a jumbled pile of large boulders. A short spur in the trail leads to the head of a small box canyon, where some of the 20+ ice age relict plant species can be seen growing in the acid soils and cool, moist canyon walls. 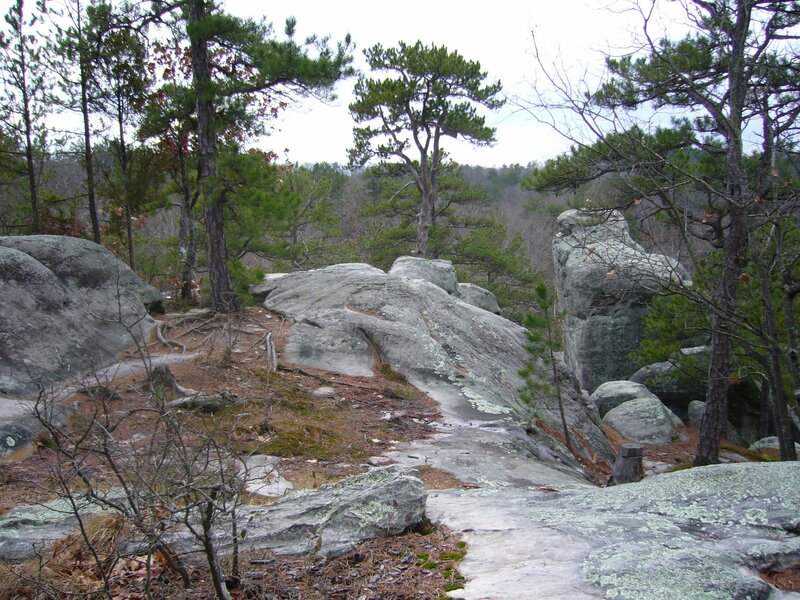 Near the end of the loop lies Piney Glade, an area where the exposed sandstone bedrock once again creates a dry, harsh environment. Poverty grass and little bluestem grow in small, shallow pockets of soil scattered amongst stunted shortleaf pines and blackjack oaks – creating a small prairie surrounded by a sea of forest. All three forms of lichens can be found on the rocks and soils of the glade – the aptly named crustose lichens cling tightly to rock surfaces amongst foliose (leafy) and fruticose (branched) lichens. This entry was posted in Aphididae, Ericaceae, Fagaceae, Fungi, Hemiptera, Orchidaceae, Pinaceae, Poaceae, Polypodiaceae, Polytrichaceae and tagged Botany, bugs, family, ferns, forest, geology, glades, Hiking, landscapes, lichens, Missouri, nature, orchids, science, trees, wildflowers. Bookmark the permalink. What an incredible place. And great commentary to go along with the photos.